Because there's no points for second place. 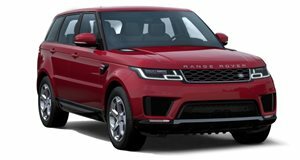 Not long ago we learned that Land Rover was planning an update for its mighty Range Rover Sport SVR. Due to hit dealerships in 2017, the UK automaker still hasn’t fully confirmed what we can expect other than a few minor exterior and interior styling updates. There was a rumor, however, claiming the supercharged 5.0-liter V8 would be receiving an update in the form of increased power. We doubt anyone would object to that. And now, thanks to our spy shooters, it looks like we have proof that’s indeed happening. These latest spy images of a 2017 Range Rover Sport SVR test mule reveal not only a new bumper but also larger front air intakes. Translation: our earlier suspicion that the new Jaguar F-Type SVR’s 575 hp supercharged V8 will make its way to this SUV. Currently, the Range Rover produces 550 hp, but the upgraded engine will see that boosted to 575 hp. In light of growing competition in the high performance SUV segment, namely from the Bentley Bentayga and the upcoming production-spec Lamborghini Urus, Land Rover isn’t taking any chances because, after all, there’s no points for second place.